Chest (1) : To get the right size run a flexible tape measure across the fullest area of your chest, holding the tape measure horizontally. Waist (2) : Measure around the narrowest part of the waist, keeping the tape horizontally. Hip (3) : Stand with your feet together and measure around the fullest point of the hip, keeping the tape measure horizontally. 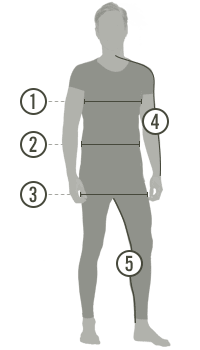 Inseam (5) : Measure from your crotch to the bottom of your leg. Be aware that the inseam measurments are based on a regular inseam.